MapTube is a new site from our lab, the Centre for Advanced Spatial Analysis at University College London. Put simply it is a place to share, mix and mash maps with a nod towards professional map makers rather than the more widely seen ‘MyMaps’ type applications. The main principle of MapTube is that shared maps can be overlayed to compare data visually. For example, to see a map of the London Underground overlayed on top of a map of population you simply go to the search page and enter the keywords “tube” and “population”. Then click on the two relevant maps to add them. In this way any combination of data can be quickly an d easily visually compared. The maps are created using our free of charge software – GMap Creator, a new version launches this week allowing any ESRI .SHP file or Formatted .CSV to be converted and used on MapTube. 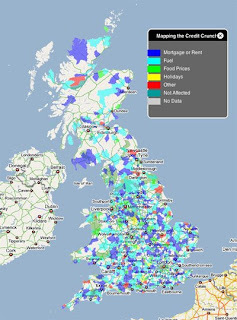 For the last few weeks a back end section of the site has been used by BBC Radio Four’s PM Show to create a mood map of the credit crunch in the UK. Radio 4 listeners have been inputting their postcode and answering a simple question on the credit crunch to automatically create a map of the nations mode. This indicates a future direction of the site with both freely available software and server based map applications, all subsequently viewable against any other local, national or global dataset on the site. It is early days but we see MapTube as an exciting way forward in sharing and viewing maps online…..
interesting idea, good design, easy handling. like it. but how about adding the google-maps-terrain-option? as for some maps, both satellite and street-map are not really suitable for a smooth reading. We might change it to House Prices as i guess its quite confusing. Looking forward to seeing the health data btw.